WOOHOO! 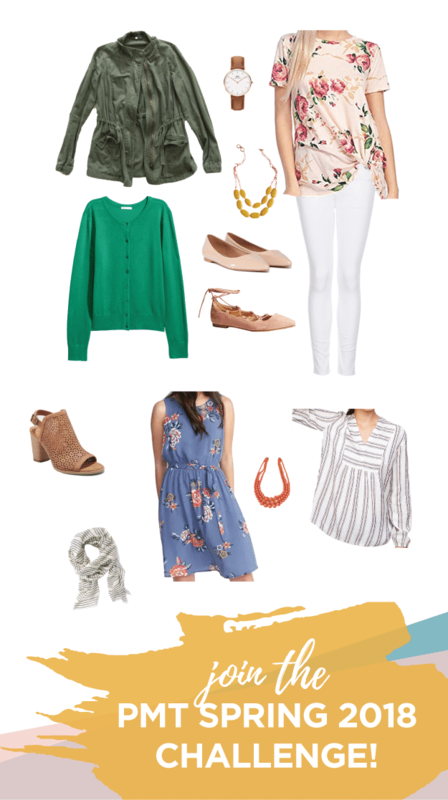 It’s time for a Spring Capsule Wardrobe! This capsule is full of color and will put you right in line with a dressy-casual spring wardrobe. It can be dressed down to be more casual by choosing jersey and cotton tees, or dressed up to business casual by swapping jeans for pants or chinos and the denim and utility jackets for blazers or cardigans. 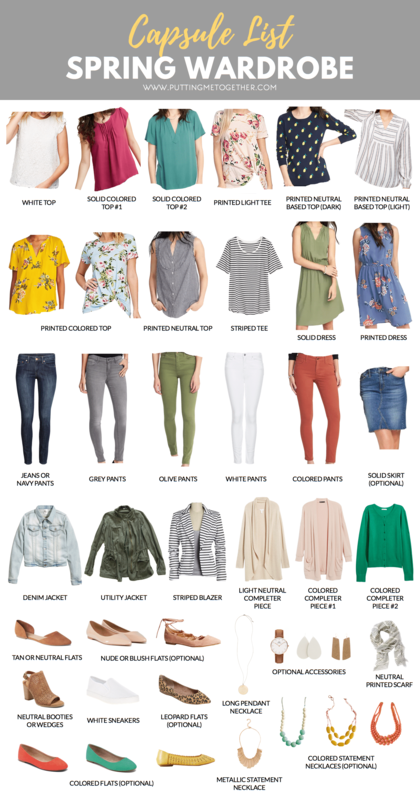 This is the spring capsule wardrobe that we’ll be using for the PMT Spring 2018 Challenge, which starts on Monday! It’s been so fun to see the buzz in the Facebook group as women have been getting their spring wardrobes ready and challenging themselves to try new things! 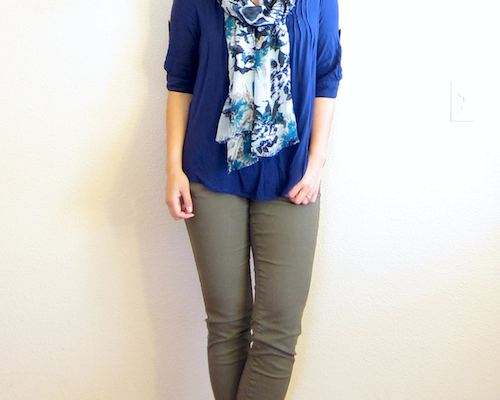 I’ve been posting capsule or sample wardrobes here for years, but enough women said they wanted further help putting all the pieces together (despite all the outfit ideas that are also here! ), so PMT Challenges began. If you want to join, it’s not too late! A good number of women have joined challenges after they’ve already started. I would just say that if you are trying to build a wardrobe from scratch, joining at this point might be overwhelming since you don’t have much in your closet to work with, so I wouldn’t recommend that. 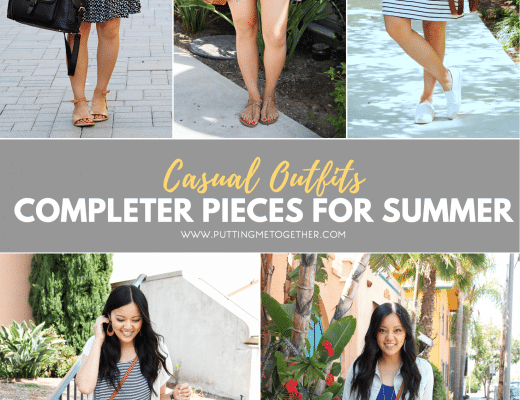 But, if you have pieces that fit the text descriptions in the collage below (like “Solid Colored Top” or “Printed Neutral Based Top”) then you’ll get 60+ outfit ideas with this collection by joining the challenge. Plus you’ll join a very incredible group of women who are having fun with style together! Sign up HERE! You can shop this capsule through the links below, and you can view my other capsule and sample wardrobes HERE. Wondering if you have the floral Amazon tees to comment on the quality or fit? I have the top in a striped version that’s not available anymore. I got it in M and it’s got a really loose fit. I’m wearing it here: https://www.instagram.com/p/BfZ5tRzhlkZ/?taken-by=puttingmetogether. I bought it last summer in Medium when I wasn’t pregnant, but the pic I just linked is me at 31 weeks pregnant and it’s still loose! Someone in the PMT Challenge who is usually my exact size got it in S, and it fits her but a little more like this: https://www.instagram.com/p/BX4Sd2MBVs6/?taken-by=puttingmetogether. I think either size would work depending on how loose or fitted you want it. Quality is comparable to other tops at that price. I imagine all prints use different materials and feel different, but my striped one is really soft!